Best in Show Solitaire is rated 3.5 out of 5 by 15. Rated 5 out of 5 by Quincy_Fishing from Love this little card game!! Oooh, just like Fairway Solitaire, Best in Show has a little more to offer than just a solitaire game. After I figured out what each doggie's strength was (As a stroke survivor, it takes me a while for the gears to kick in!! ), I like changing the dogs out and buying a new puppy as I earned money. Some of the dogs take a little more training and some were just downright obstinate! Anyway, it's a fun game that I enjoy whiling away the time with! I do wish there was some narration, like on Fairway; other than that, I recommend this game if you like solitaire! Rated 5 out of 5 by LadyScarletttttt from Fun ! I thought that this game was cute ! I enjoyed playing it....Good for kids ! Rated 5 out of 5 by AccessDad from Great 'Golf Solitaire' Game Best in Show and Fairway Solitaire are among my favorite games on big fish games. I love how each dog in this game has unique abilities. It kept me playing trying to figure out the best dog for each level. 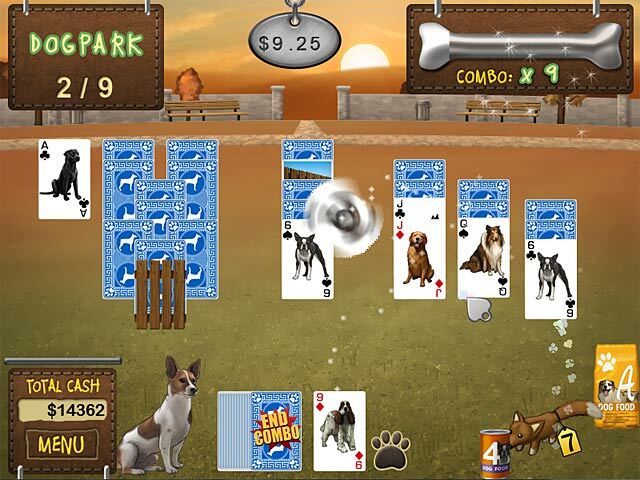 Rated 4 out of 5 by Gameritis50 from Dog lovers will enjoy this one If your a dog lover as I am, try this solitaire game. Your gameing experience will guide you. Unlock dogs, visit the pet shop and enter the dog show. Good luck. Rated 4 out of 5 by Jano145 from Don't Let the Glitches Get You Down I've played this game all the way through several times and loved it more each time. It's obviously designed by dog lovers which makes it very special. It's one you can enjoy over and over and have a different experience each time. It's a golf-type game, where you play each successive card either one higher or lower. What adds to the fun is using each dog's skill to improve your score, whether it's finding toys on the field or chasing squirrels or a multitude of others. The graphics are clear and the sounds add to the scenes. Perhaps the biggest plus is how long it takes to complete the game.You definitely get your money's worth and with a little patience, have a blast playing it. 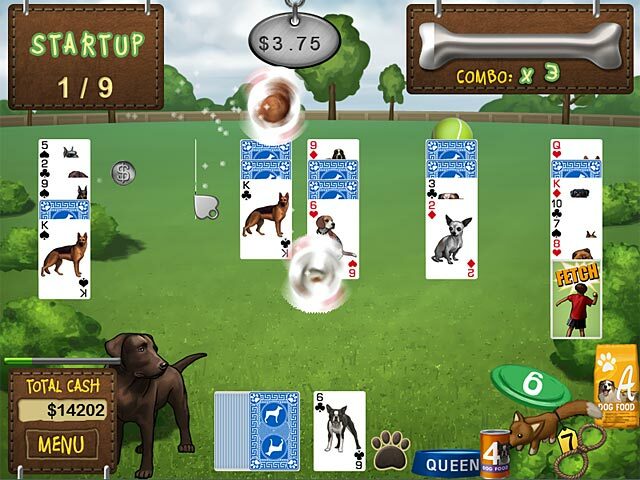 Rated 4 out of 5 by Patje501 from another great solitaire I've just bought this game and in the beginning it was a bit confusing with all the different dogs and what to do but when you play more the game seems to grow on you. I've only played a few hours untill now but i like it more and more . A lot of levels ,not too easy it seems and a lot of stuff to spend your winnings on. I don't think you can find the full potential of this game in the one hour demo but its always best to play the demo first. I like it and I will put another review in a month or two when i'm further in the game. But for now it looks like the makers have tried to make a game with great play value and a lot of stuff in it to keep it interesting. Rated 4 out of 5 by Melvin2 from Liked it but a little glitchy I really liked the graphics and the option to buy and use different dogs. I had a little trouble with disappearing items, but I just played through them and nothing was crucial. I enjoyed the solitaire game play with the various hurdles. Using the different dogs with different abilities to help you get thru the games, it kept it from getting too boring. Rated 3 out of 5 by pennmom36 from I WOULD HAVE BOUGHT THIS GAME BUT...... I have worked in the pet industry since I was 17 years old, and own a successful grooming salon, so naturally, I had to check out this dog themed Solitaire game. I love the uniqueness this game offers, and the clever use of dog themed features, however, there is no option to replay levels, win or lose, so I won't be adding this game to my vast library. You can choose from 3 different modes of difficulty, Easy, Normal and Hard, and I even tried switching to Easy mode, but that mode didn't allow me to replay the levels either. Other than that major glitch, everything else is really cool. You start out with 3 dog breeds to choose from, but eventually unlock other breeds (40 total) ranging from a teeny tiny Chihuahua, to a Shiba Inu. 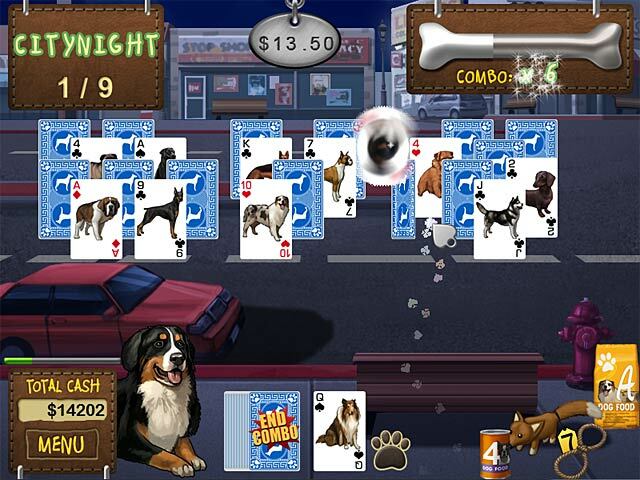 Each dog has different abilities and different price tags, which can be purchased with the money you earn playing this Higher/Lower style Solitaire game. Even the Shop is dog themes as well as the bonus items offered within the "Pet Shop" Bonus Wild Cards are number specific, other items increase your dogs obedience, stamina loyalty. There are blocked cards that require a tool card to remove such as a Dig Card to break the Fence Card, or a Tennis Ball to remove the Fetch Card. If you are a dog lover, give this one a try, it really has some unique features. If you are ocd about receiving a perfect score before moving on, like I am, then you probably won't "dig" this game. This would be a 5 star Solitaire game if there were an option to replay each hand, or even the entire 9 hand level at minimum, so for me, it's a no go because of that feature alone. Be the Best in Show in this gripping Card game! 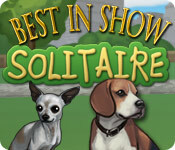 Use different dog breeds’ special abilities in Best in Show Solitaire!